NEW DELHI: The Hafiz Saeed led Lashkar-e-Taiba (LeT)’s student wing, Al Muhammadia Students (AMS), has developed a mobile handset meant exclusively for communication by LeT members with each other. After entering a particular chip, the handset automatically connects with the nearest mobile tower, irrespective of the telecom service provider, and calls made using this handset cannot be traced by intelligence agencies. If at all intelligence agencies try to intercept the device, the call will automatically terminate. These and other worrisome revelations have been made by 20-year-old Multan-based LeT terrorist Zaibullah alias Hamza during his interrogation by the National Investigation Agency (NIA). Zaibullah was nabbed from a house in the Jugdiyal area of Kupwara on April 7. Son of an income tax officer in Pakistan, Zaibullah has further claimed that LeT, a global terror outfit, recruited and trained 450 boys in 2017 from different areas of Pakistan for anti-India operations. 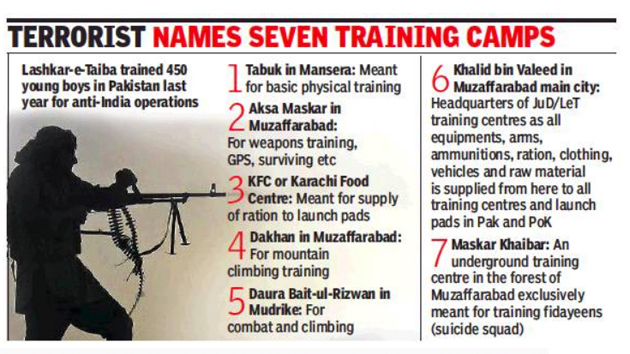 Those selected from this group were sent for rigorous arms training to other camps. Boys aged 15 to 25 years are being recruited and radicalised in the name of ‘Burhan Wani’ by LeT. Zabiullah had crossed over to India on March 2/3 this year along with five others who were all killed in an encounter with the Indian Army on March 20. Even though a bullet hit him in the hand during the encounter, Zaibullah managed to escape and was caught 15 days later. When Zaibullah was undergoing training at Dakhan in January 2017, LeT’s operational commander and 26/11 accused Zaki-ur-Rehman Lakhvi had stayed with the trainees for two months. Zaibullah says that Lakhvi motivated them for the ‘jihad’ and even hugged all the recruits. During his training at another camp in Muzaffarabad, LeT chief Saeed himself visited the recruits. Zabiullah claims his father reportedly encouraged his Jihadi activities and even donated Rs 1,000 per month to a ‘Jihad Fund’.